After sitting for ten minutes in a comfy lounge area overlooking a leafy tributary of the Nile, a group of nine men in jackets and ties entered the room. Setting down their intricately patterned mats and kneeling down to face south-east – the direction of Mecca – the Muslim Brotherhood members began to pray. More of them entered, and the lounge area began to fill up with midday worshippers. Across Cairo and Egypt, millions more were doing the same. Perhaps the Muslim Brotherhood’s headquarters, on Roda Island, southern Cairo, has a greater number of pious worshippers than the average Egyptian office. But the scene was not a remarkable one. Despite this, many in the West fear the brand of Islam promulgated by the Brotherhood. Opinion about the organisation ranges from the belief it is a mere fig-leaf for militant Islam, to worries about how robust its latter-day democratic credentials would be if it ever attained power. But in an interview with Think Africa Press, senior Brotherhood members said that one of the main reasons behind these fears was that in the post-Mubarak epoch the West now stands to lose a great deal. Moreover, Dr Esam El-Erian, a member of the Brotherhood’s Executive Bureau, issued a stark warning to Western governments. Sitting in a cramped, bright office next to a mother-of-pearl carving of the Dome of the Rock in Jerusalem, Dr El-Erian said Washington should know that it is “not the only power in the world”, and criticised them for being “friends of the Mubarak regime”. The Muslim Brotherhood, which has been banned in Egypt for much of the past 50 years, was founded by Hassan al-Banna in 1920s. It was initially conceived as an organisation for encouraging the spread of Islamic piety. But al-Banna also crowned himself as the Supreme Guide who would one day lead a purified Muslim state.The European liberal values which informed the constitutional government of the time were considered a cancer on society – and the Brotherhood identified itself as the cure. The group established a paramilitary wing to fight British rule, and later, during the 1950s and 1960s, the influential Brotherhood thinker Sayyid Qutb wrote works which heavily influenced the radical Islamists of today. Yet the Brotherhood long ago abandoned any pretence of armed struggle against secular rulers or Western influence. According to the organisation’s deputy leader, Rashad al-Bayoumi, al-Banna’s initial goal of extending Muslim influence beyond the Middle East was still relevant to the organisation. “Everyone who has a vision, or concepts or principles, tried to spread these thoughts through peaceful means,” he said. “There are Christian figures who try to peacefully spread Christianity here in Egypt and Islamic countries in the Middle East. Everybody tries to spread their thoughts in a peaceful way. This is normal. One of the great fears among Western governments is the possibility that a Brotherhood-led government would decide to rip up the 30-year-old Egypt-Israeli peace treaty – long-considered a bedrock of security in the region. There is no doubting the Brotherhood’s animosity towards the treaty, a feeling in tune with a great many Egyptians. Historically, even before Israel declared its independence, the Brotherhood called for greater support of the Arabs fighting Zionists in British Mandate Palestine. Al-Bayoumi points out that the initial 1979 peace treaty agreement was made by former president Anwar Sadat “without the approval of the Egyptian people and without being approved directly by special parliamentary councils”. In spite of this, he says that any decision on the treaty would have to be put to a parliamentary vote. There is also anxiety in the West that the election due to be held this year will usher-in an Iranian style theocracy with the Brotherhood at the vanguard. 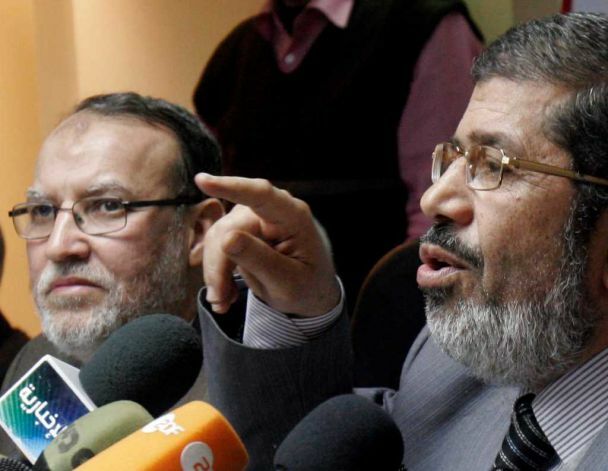 The organisation itself insists it wants a fully democratic Egypt. El-Erian talks about “the first step on the road to democracy” being the ability of Egyptians to rid themselves of foreign powers. Al-Bayoumi says he wants the military to be true to its word and oversee a transition to a democratic state. But leaving aside the separate question of whether the army will fully relinquish its current grip on power, many ask whether the Brotherhood would even be capable of winning an openly contested election now. Many of the anti-government protesters – Muslim, Christian, secular or otherwise –scotched the notion of the organisation having enough support to seize power. Others have asked whether the oppression of the Mubarak years intensified the misleadingly bright aura around the Brotherhood. The feelings have been fuelled by suspicions that the organisation was slow to commit itself to the protest movement. It is a suggestion Al-Bayoumi does not take seriously. The coming months will see whether the Brotherhood remains the force it has often been painted as. Leaders in the West will be waiting with bated breath. Just 17 days ago Tahrir Square was reverberating to the sound of exploding tear gas canisters as riot police fended off advancing demonstrators. Tonight some of those demonstrators were making just as much noise again – only this time it was with flares and fireworks. Pharmacist Ahmed Ashmawi, 28, was one of the protesters who have been camping out in Downtown Cairo since anti-government activists made Tahrir Square their stronghold on January 28. As Egyptians danced in the street around him and ecstatic men and women whooped like American Indians, he said: “We’ve made history. “I cannot believe this moment has come and we are living in it. Many times here over the past few weeks it was announced that Hosni Mubarak had gone – and every time it was wrong. Ahmed was one of the demonstrators dispersed by the police after initially occupying Tahrir Square on the night of January 25th – only to return three days later and break through police lines during the violent clashes which followed Friday prayers that day. According to him, the scenes a week last Wednesday, when pro-Mubarak mobs sparked bloody confrontations with anti-government demonstrators to the north of the plaza near the Egyptian Museum, were decisive. Ahmed’s thoughts at the time proved prescient. Many saw the ugly pitched battles between the two sides that night – along with the government’s suspected complicity in them – as Mubarak’s desperate last throw of the dice. In the days that followed demonstrators were never truly threatened again. The barricades at the northern side of Tahrir Square were reinforced and multiple rings of security checks were imposed by protestors. The disappointment of Thursday night, when Mubarak stubbornly refused to step aside after fevered expectations to the contrary, only added to the sense of bewildered euphoria when his resignation was finally announced. “After yesterday night I was thinking what should be the coming steps,” said Ahmed. “Some thought we should march on the national TV headquarters, others thought the presidential palace. 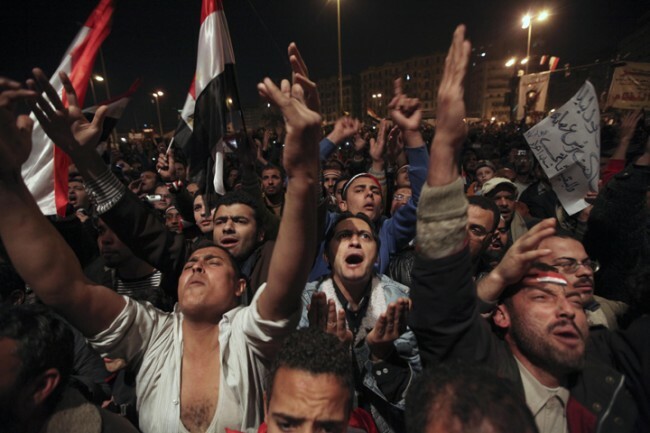 When the Egyptian president’s resignation was confirmed just after 6pm Cairo time, cries of “Egypt free again!” and “We’ve finally got rid of the thief” rang through the air in Tahrir Square. Some kneeled down on the asphalt to thank God, while in the nearby Qasr El-Aini Street others drove at snail’s pace in convoy down the road waving V-signs and honking their horns. Alyaa El-Salamony, a mother-of-two and a general manager of an imports company, said: “Hosni Mubarak did not listen to the people. Mahmoud Aziz, a 25-year-old who had also been coming to Tahrir Square since January 25, said he had never felt so happy in his life. After being dispatched to the sandy schoolyard of the Toshka Primary School in 6th October City, the two tanks showed no mercy. Overlooked by squadrons of soldiers positioned on the rooftops of nearby apartment blocks, they sprayed the front of the five-story school building with round after round of machinegun fire. The operation lasted for 24 hours, according to locals. By 10.30pm on Monday evening, five suspected escaped prisoners who had been hiding out in the building were dead. A trip to the Toshka Primary School sheds light on a tale of two cities during the country’s recent political upheaval – not just in terms of the differences between 6th October City and Cairo, but within this sprawling satellite settlement itself. Two weeks after the violence of January 28th, with many residents in the more affluent areas of 6th October City having disbanded their ad-hoc neighbourhood watch groups, people here still feel vulnerable. According to Leila, on Tuesday night householders had to fight off more suspected criminals seen in the area near the Toshka Primary School. Although she said she was against president Hosni Mubarak, she added that it was time for the Downtown protesters to leave Tahrir Square. “They must go home and give Mubarak another chance to fix the situation,” she said. The school lies in a decaying neighbourhood of 6th October City close to a huge industrial zone. The surrounding streets are a warren of grimy, concrete apartment blocks buzzing to the sound of weaving tuc-tucs. 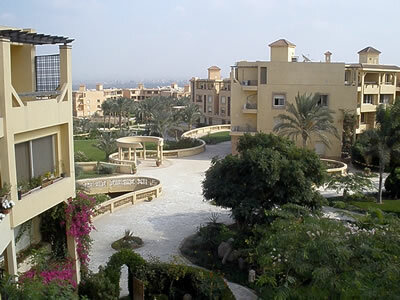 It is a far cry from the rest of the city, where ultra-rich Egyptians live in a theme park world of gated villas, topiary hedges and compound golf courses. Outside a cafe just a short drive away from the school – near the upmarket boutique shops and all-American diners of Al-Hosary Mosque Square – sat 41-year-old Bakr Haindich. “This place is safe,” said Mr Haindich, a Jordanian, who like so many in 6th October City is a foreign Arab national. Diana Sheheen, who was sitting smoking a shisha pipe with her friend in Cafe O2, agreed. But the glitz of the upper-class neighbourhoods has not been enough to shelter everyone from the aftershocks of the January democracy movement. A 10 minute drive away, past the half-built luxury compound of Sawfa City — where an enormous 30ft-high banner proclaims “New Experiences Await You!” — is Sheikh Zayed city, another satellite settlement where the filthy rich rub up alongside the down-at-heel. Sitting behind a desk in the office of his billboard advertising company, Magdi Al-Sharif reveals that neighbourhood watch groups in his area caught 18 suspected prisoners only this week. As head of all the groups he said that most of the people caught were not trying to break into homes, but that people in the area were still worried. “In this area they have not been trying to steal, they have been trying to change their clothes or just get something to eat,” he said. Mr Al-Sharif said he thought most of the prisoners turning up in Sheikh Zayed were not a threat because they had been set free by the government against their will. Nonetheless he said residents were still frightened. Originally published in The Spectator, Feb 1st. As the imam rounded off his midday Friday sermon, the ring of more than three hundred riot police encircled the worshippers. It was no ordinary congregation. A stellar assortment of Egyptian directors, actors and political bigwigs were assembled in an enormous crowd on the pavement outside the Mustafa Mahmoud mosque in Mohandiseen, Western Cairo. Minutes later the atmosphere had turned febrile, as the worshippers began to chant anti-government slogans. The baton-wielding riot police, who had been drafted in after the surprise turnout during Tuesday’s protest, soon crumpled under the pressure, and were forced to allow the heaving crowd out. By the middle of this week some of the protestors, along with thousands of others, would be camping out in Tahrir Square, the iconic plaza in downtown Cairo which has become the focus of Egypt’s upheaval. 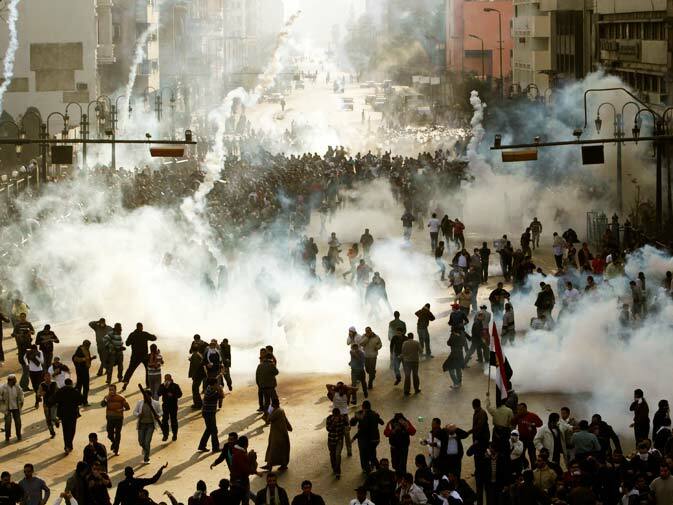 But last Friday the Egyptian capital was still tightly under the control of the authorities. The demonstrators from Mohandiseen were just one group among many across the city who had gathered before midday prayers with the intent of shattering the status quo. By the time they had walked the few miles south-east to reach the Galaa bridge – the small crossing onto Zamalek, an upmarket residential island on the Nile – it was clear they were going to have their work cut out. Just a few yards away from the nearby Sheraton hotel, a squadron of riot-police about five men deep had completely blocked the way of the river. Four green riot vans were parked behind them. The marchers by now must have stretched for at least a mile and a half back down the main road. As they approached the bridge, the police blasted teargas canisters into the air like mortar fire, dispersing some of the demonstrators into nearby side-alleys. Not long afterwards at around 2 p.m., the signature chant of the anti-Moubarak movement rang out: “The people want the system to fall!” The next few hours saw something close to open warfare on the streets of Cairo, as scenes unknown during Hosni Moubarak’s time unfolded. By 6 p.m. the pendulum was swinging against the riot police. The thousands of demonstrators from Mohandiseen had broken through into Tahrir Square and had met up with other groups from around the city. The riot police had amassed on Qasr El-Aini Street, the road running south from Tahrir towards the parliament. A nearby mosque was appropriated as a makeshift hospital. Ahmed Ra’asat, a twenty-six year-old dentist, was one of the bloodied and bandaged protestors lying grim-faced on the floor. A trip to the French Institute Hospital, a mile or so south of Tahrir Square, confirmed the ferocity of the evening’s events. Here alone thirteen had died. All had suffered shotgun wounds from police weapons, according to Dr Ahmed Mawad, from the Intensive Care Unit. More than four hundred were wounded. At the nearby Old Qasr El-Aini Hospital, they recorded twenty dead and five hundred injured. Shotguns were again the biggest cause of death. By the next morning the army had taken control of the streets. At least twelve tanks and twenty armoured personnel carriers were blocking off the main roads into Tahrir Square. Towering over them was the smouldering riverside HQ of the ruling National Democrat Party, which had been torched the previous night. Over the next few days an uneasy calm settled over Cairo. Banks remain closed after the Friday demonstration, while looters emptied ATMs all round the city. The stock market also took a tumble, losing sixteen points over two days by Monday. As the violent aftershocks of Tunisia’s Jasmine Revolution shake Hosni Moubarak’s government to its foundations, there are millions of Egyptians hoping his prediction will prove to be correct.